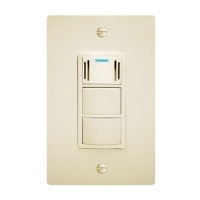 The WhisperControl Condensation Sensor switch provides three controls for the exhaust fan rolled into one. It works as a humidity sensor, countdown timer, and allows for manual control of the exhaust fan. The control contains a sensor that automatically activates the exhaust fan when high humidity levels are present. It contains advanced technology that senses both the temperature and humidity level in the room. Once the ideal combination is achieved, the sensor turns the fan off. Activating the countdown timer puts the fan on a 30-minute operation schedule. When the exhaust fan is turned on manually, the 30-minute countdown automatically begins, and after this period, the fan is again shut off. For manual control of the exhaust fan, push the switch on the timer that indicates manual operation. If the fan should be shut off before the room has been properly ventilated, the condensation sensor will activate the exhaust fan until the air has been cleared.